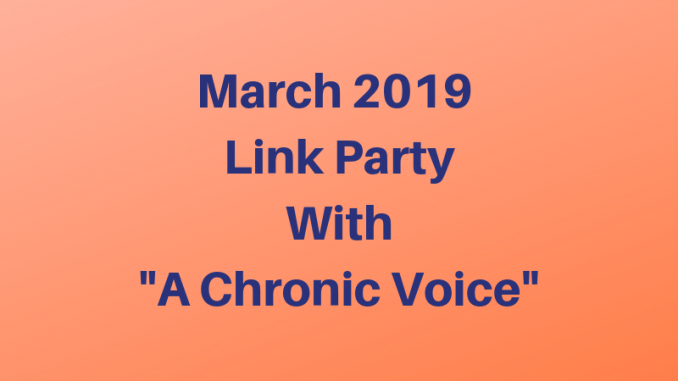 March 2019 Link Party With "A Chronic Voice"
I have really been struggling with feeling like a colossal failure for the last 13 years. Ever since my marriage imploded in 2006. And my health failed 6 years ago, and I couldn’t keep up with my nursing job. And last November when my oldest child kicked me out of her life. I’ve been doing counseling, and really trying to pause from the negative self-talk that is all too normal for me. Trying to look at my marriage from a different angle. 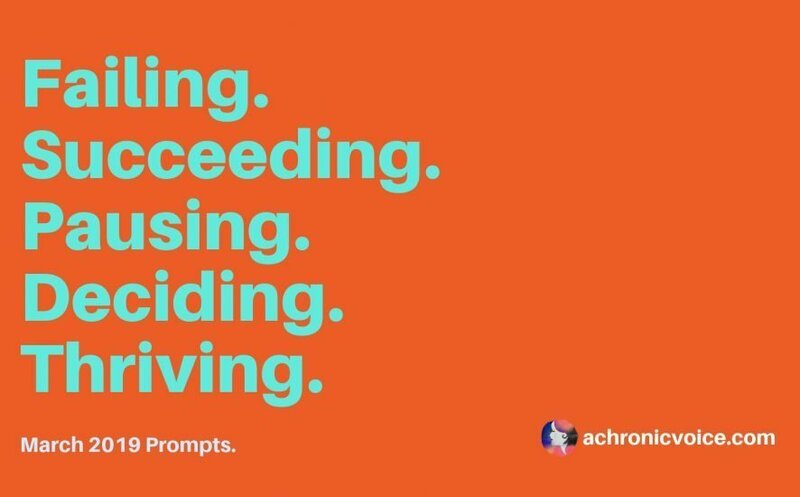 My counselor is helping me do this. This pause is helping me to get some perspective. I’m beginning to see that I did the best that I knew how to; both in my marriage, and in raising my children. I know that I made mistakes. We all do. But I’m finally understanding that my ex made his choices. That only he is responsible for his behaviors and words. That I wasn’t responsible for the abuse that happened. He was. This pause and changing perspective has helped me see that I’ve been carrying the weight of responsibility for his actions. They weren’t mine to carry. How freeing to put those weights down!! I’ve also realized that my children, as adults, are now responsible for their own lives. I’m not responsible for their choices, either. I did the best I could with the resources I had. The rest is up to them. More weight released! When I’m tired or flaring, it’s so hard to remember that I’m not the one who messed up my marriage, and my children. So, I’m deciding to write these truths down and refer to them often. I’m also deciding that after a lifetime of doing what others wanted me to do, that this is my time. Time for me to figure out what I want from my life, and to work towards it. My counselor has instructed me to create a Bucket List. I’m actually looking forward to creating one! I have succeeded in losing 59 pounds of body weight since late August 2018! This thrills me to no end! I put most of this weight on after my divorce. It truly feels great to not be carrying it around anymore. This success is helping to open up the world for me. I don’t feel as hopeless about my life now. New possibilities. Scary, yet exciting at the same time. For the first time, I’m beginning to see the possibility that I don’t have to live in survival mode, rushing from urgent task to urgent task. That I can live my life at my speed, and the world will just keep turning no matter what I do. I was killing myself with overeating, trying to stuff my grief, guilt, shame, and anger over how my life turned out. The Bright Line Eating Plan has truly given my life back. For this I am grateful!! I am also truly grateful for a wise counselor to help me make sense of the chaos and confusion!! I hope my story encourages you. Our stories are really important. Share yours with someone you trust. You can read other party participants’ posts here. If you missed last month’s Link Party you can read it here. I welcome comments below. If you’d like email notification of new posts, please enter your email address below. You can cancel at any time. Subscribers have access to the Subscribers Only Resource Library filled with goodies. Wonderful post and blog. Kathy. I’m so glad you came by, Anita!! I’m glad that you feel you’re getting your life back Kathy. And wow!! That’s quite a success with the weight loss. Thank you for coming by, reading, and commenting! Thanks Sheryl for reading, commenting, and hosting the link party. I hope you have more health and happiness in April, too! !